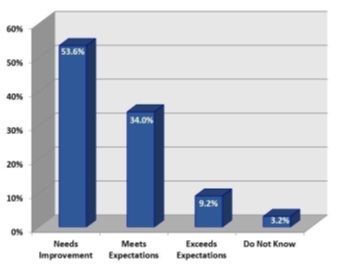 B2B Sales – What is Your COI – Your Own Cost of Inaction? Recently, I put two articles on my blog that have caused a lot of comments about how to sell to B2B prospects and clients, and promises by readers about using the action steps I pointed out in the articles. The articles are about showing your prospects and clients their COI – Cost of Inaction – what it is costing them by not buying, and fully utilizing, your products and/or services. But there is one other group that also needs to be aware of their COI, or cost of inaction. And for you, this is the most important group. And that group is you and your company! 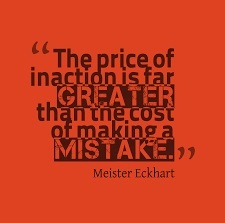 What is your internal COI – Your Own Cost of Inaction? First of all some stats. CSO Insights, a B2B sales research firm, surveys thousands of companies every year on the results they are achieving in their B2B sales and marketing efforts. 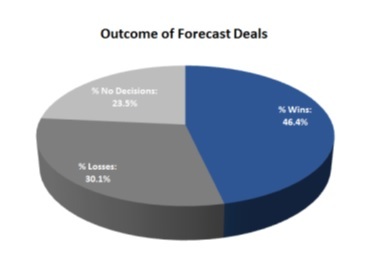 In 2014 only 46.4% of forecast deals were actually won. This means that 53.7% were lost. I believe Vegas odds are better than that. So what is causing this lack of accuracy in forecast deals? What barriers need to come down? As you can see, there are many barriers to getting an accurate forecast. Are these actual reasons, or just excuses? I believe they are real reasons, because B2B sales and marketing people are not getting enough of the right training, and especially follow-on coaching to be as successful as they can be. 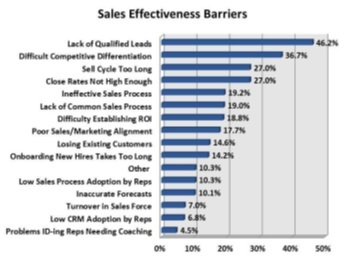 Again, from the chart below, you can see that only 10.1% of B2B sales and marketing people really understand their customer’s buying process. And only 9.2% of B2B sales and marketing people actually exceed expectations for how to build the right business case. I believe the “meets expectations” number is more of a guess because those companies don’t want to be shown as inadequate in their forecasts. Sales’ ability to build a solid business case and/or ROI. So how can these results not only be improved, but significantly improved, so that B2B sales people and marketers are really driving your revenues and profits? This can all be done with the right training and coaching! 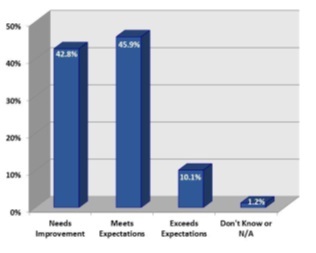 What measurable sales improvements are results of your sales training investments? So what then is your internal COI – your Cost of Inaction? By not giving all of your revenue generating teams the training they not only need, but deserve, you are not achieving your full potential of revenues. What would that mean to you, not only for the growth of your business, but the profits you could achieve, and with the same number of people? How excited would you be over that, knowing that the shareholder value of your company is growing without any expenditures for more people? In fact, there is a good possibility you could do it with less people. So, even before you look at talking to your clients about their COI, you need to look at your internal COI. You need to look at getting the right training, and especially follow-on coaching, for your sales and marketing team. Have you and your sales and marketing team been given the right training and coaching. If not, STOP YOUR INACTION NOW. Think of the COI! I have found, in my 40+ years of business life, including as a B2B salesman, business owner, and coach/trainer, that training and coaching usually costs less than 10% of the increases in revenue you will achieve. And in many cases, it costs less than 1% of the increase in revenues. Call today to see how you can increase your shareholder value by driving your revenue growth to new heights ASAP, and start enjoying financial freedom sooner. This article was syndicated from Business 2 Community: B2B Sales – What is Your COI – Your Own Cost of Inaction?